Do you play a Brass instrument? Join us for Brassmas! 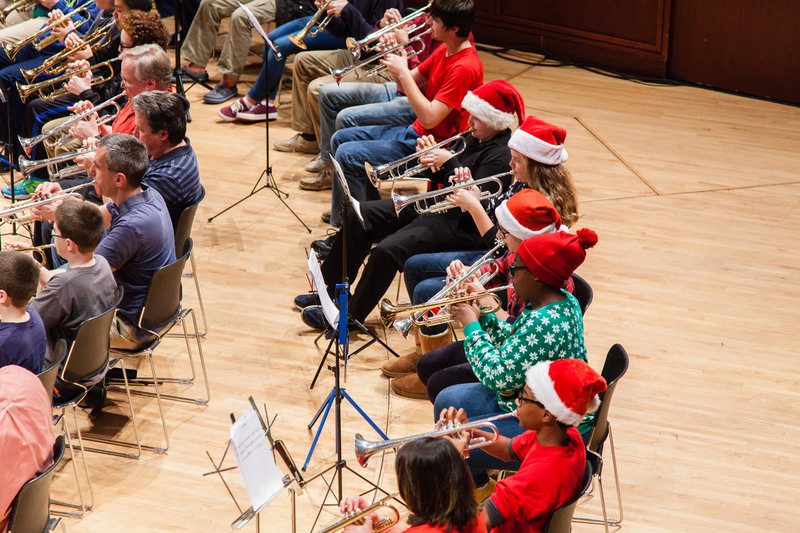 Brassmas is an event open to ALL brass musicians of any age. The Triangle Brass Band organization invites any and all brass players to join us in playing Christmas carols prior to our concert on Thursday December 13, 2018 at the Duke Energy Center for the Performing Arts in Raleigh, and of course, stick around and listen to our concert!!! 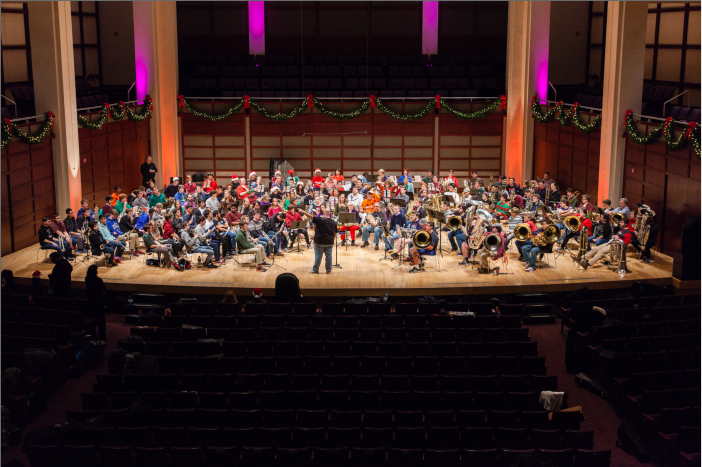 Bring friends and family and enjoy a night of Holiday cheer, as it should be…BRASSY. Registration – Brassmas registration includes admission to the the proceeding Triangle Brass Band concert. Please sign up using our registration form and then follow this link to pay for your registration. Pre-registration is $15 for adults and $10 for students and seniors; onsite registration is $20 for adults and $15 for students and seniors. 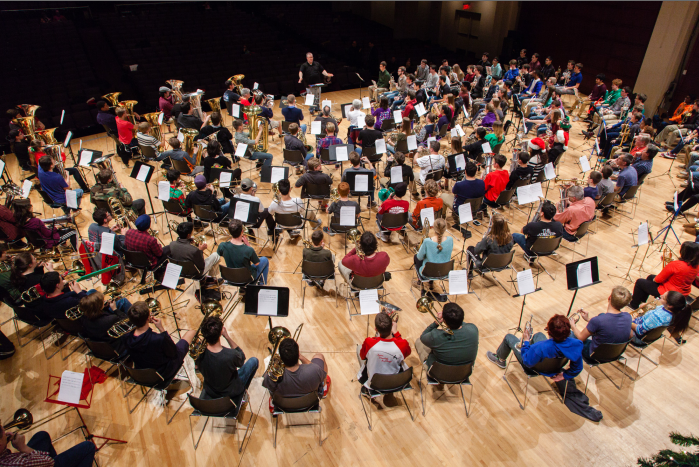 On the ticket site, choose either Student Brassmas Registration or Brassmas Registration – your ticket to the concert is included! Rehearsal – There is a short rehearsal from 5:00 – 6:00 PM on stage at Meymandi Hall. You must enter the performers’ security entrance back stage where registration will be held. Logistics – The backstage entrance is the only door you can use to enter, and you will be directed to the lobby for registration. Only performers will be allowed backstage. There will be an area set up to keep instrument cases out of the way of traffic flow. There will not be room for cases backstage. It is recommended to store instruments in vehicles during the TBB concert (after the Brassmas performance). What to Wear – Dress casually and have some warm clothes for the performance. A Santa hat is a fashionable and sensible choice! Parking – It is recommended you use the Performing Arts parking deck on South St. (between Salisbury and McDowell). There is a fee for parking there. Walk down Salisbury St. and enter the hall at the backstage security entrance, for registration.